Meghan Enwright had reached her limit. Exasperated by her young sons’ maddening new habit of flipping half-filled water bottles into the air in an effort to land them upright, the Marshfield mother pecked out a quick Facebook post voicing her displeasure. Almost immediately the responses from other parents started rolling in. 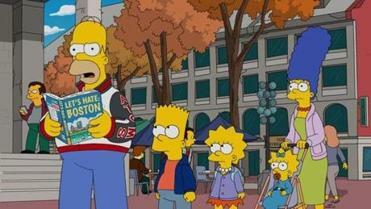 Crammed with references from Fenway Pahk and Jahdan’s Furniture to Whitey Bulger, the episode plays like a game of local Trivial Pursuit. 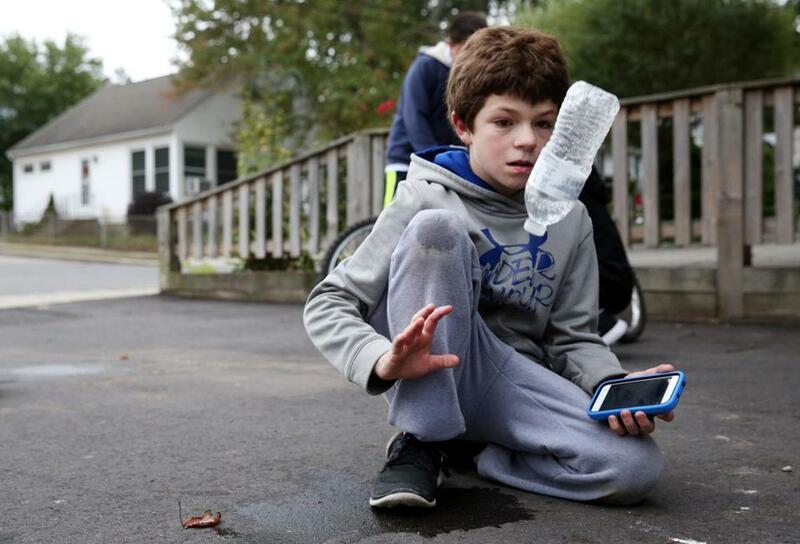 It’s not hard these days to find kids flipping bottles: at bus stops, at middle-school lunchroom tables, inside Little League dugouts, even on national television. At one point during last week’s Patriots broadcast, a camera cut to some kids in the Gillette Stadium stands, absent-mindedly bottle flipping as the home team rolled to victory. For kids, the draw is simple. Even in an age of digital distractions, this diversion is quick, it’s portable, and while the science behind it is actually fairly elaborate — water, angular momentum, and gravity paving the way for a soft landing — it requires no training. For those wondering how this started — or simply in search of a target for their ire — a good place to start would be Michael Senatore, an 18-year-old from Charlotte, N.C., who could be described as the Godfather of bottle-flipping. Last spring, finding himself without an act for his high school talent show, Senatore decided to try his hand at bottle-flipping, a hobby he and his classmates had dabbled in a year earlier. Armed with some dramatic music and a good amount of swagger, the teen strolled on stage and, with a flip of the wrist, landed a small, partly filled plastic bottle upright onto a nearby table. MORE: Did NASA just change your zodiac sign? Not least of all, it brought the previously underground art of bottle-flipping to the masses. Since then, legions of participants have pushed it forward, adding twists along the way. No longer, for example, does a traditional flip like Senatore’s cut it. “Capping” — that is, flipping a bottle so it lands balanced on its cap — might now be the quickest path to school-yard glory. YouTube, meanwhile, is filled with videos of Senatore acolytes attempting increasingly creative and challenging flips: off trampolines, atop hoverboards, through basketball hoops. Despite the glowing reviews of adolescent flippers, parents have been far less enamored. There’s the incessant thump … thump … thump of partly-filled bottles crashing through their homes. And the cost. Enwright stopped buying bottled drinks altogether, she says, after her kids began tearing through $20 or $30 worth of bottled drinks a week to facilitate their habit. Parents complain that they find half-filled bottles cluttering the house and throw them out. Shane Bradley, 12, showed off his “bottle flipping’” skills while visiting the home of James Tobin in West Roxbury. And this is to say nothing of the countless bottles going airborne in middle school lunchrooms across the region. To this, young flippers offer little more than a proverbial roll of the eyes. Whether bottle-flipping has the stamina to out-last the slew of other recent fads — we’re looking at you, Pokemon Go — remains to be seen. Already, some schools have begun taking steps to temper the tossing. North Reading Middle School issued a ban on the practice at the start of the school year. Other schools also have warned students and parents that bottle-flipping would no longer be permitted. In the meantime, some desperate teachers have taken matters into their own hands. Since the flip heard ’round the world, Senatore, now a freshman at the University of South Carolina, has received a handful of messages from middle- and high-school teachers asking whether he might consider personally urging students to holster their bottles. But while he’s sympathetic to their plight, he can’t bring himself to do it. In a way, it would be like James Naismith coming out against basketball. “Whenever I see a kid flipping a bottle, I know somehow I managed to influence that kid,” Senatore said.